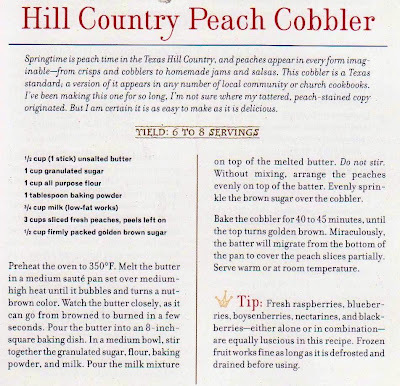 Before peach season is but a memory, I wanted to make another peach cobbler and did so recently at the request of my friend Zane who was craving the dessert. It was to be eaten at her Upper West Side apartment with her friend, the legendary Anne Mendelson, considered one of the country's most knowledgeable food historians, the author of two acclaimed books, Stand Facing the Stove, the story of the authors of the Joy of Cooking, and Milk: The Surprising Story of Milk Through the Ages and a contributor to Gourmet and The New York Times. Anne Mendelson with peach cobbler pudding. The pressure was on. I was a bit intimidated to be baking for such a food world luminary and decided to use a more modern (read: tested) recipe. Just a few days earlier I was gifted with a wonderful southern cookbook, The Pastry Queen, by Rebecca Rather and Alison Oresman, which contained a batter-based peach cobbler that was appealing on many levels, not least of which was the fact that the peaches didn't need to be peeled for this recipe. The peach cobbler was a snap to prepare. Really simple. But you know how you can do everything exactly right and make one strategic mistake at the very end that torpedoes all the good that came before? That's what happened to my cobbler. I pulled it from the oven at about midnight and I was way too tired to stay up for it to cool in order to cover the pan, so I cheated and just covered it while still hot and went to bed. Big mistake, for the foil (as Anne kindly explained the next afternoon) caused the heat to build and "steam" the cobbler. So we ended up eating something that was more like pudding than cobbler. But, it was delicious. Delicious enough for me to make again. I brought the next batch in to work, and left a note: Tell me if it's worth the calories. Everyone thought it was. Aside from its deliciousness, this is one of those special recipes where magic happens in the oven. In this case, the batter rises above the fruit creating a cake that encapsulates the peaches. See below. Batter in the pan. No mixing necessary! Peaches put atop the batter. With a sprinkling of brown sugar, the cobbler is ready for the oven. Hot from the oven. The batter has risen above the fruit. 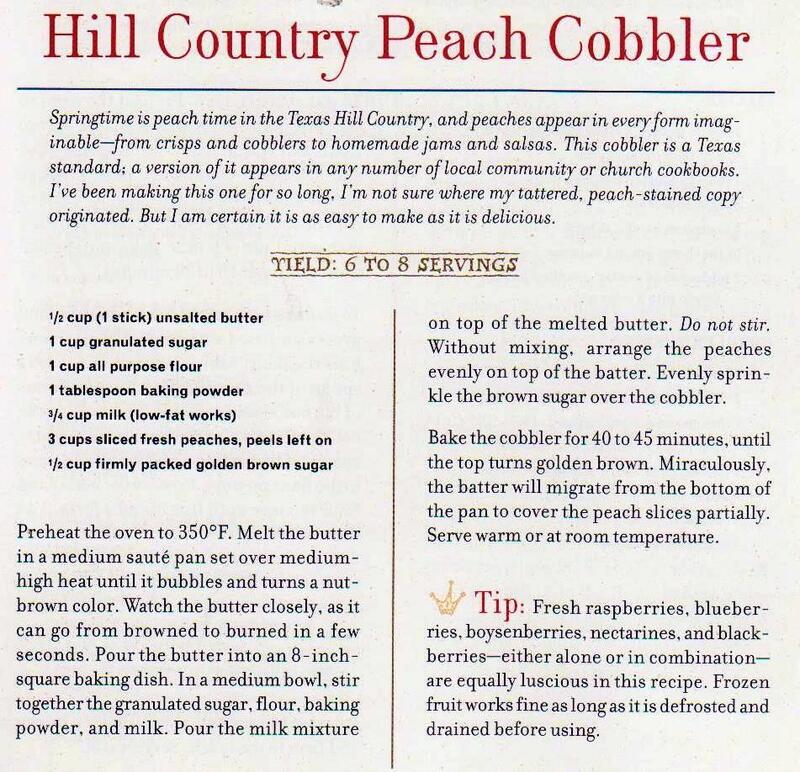 This cobbler is different than the more common biscuit type cobblers, in that it is batter-based and, at least the second time, around tasted like a wonderful moist cake studded with slices of peaches. I'm going to make this for Zane and Anne next year for sure. Meantime you can watch for the debut of Anne's new blog -- the reason for our afternoon meeting was a lesson in blogging which we managed to fit in between eating the sweet and savory Chinese dumplings Anne brought (her new book is on Chinese food), the lovely dinner Zane made (chicken and couscous tabouli) and the cobbler. In my south central Texas childhood this was called "No-Stir Pudding" for reasons I still don't entirely understand. I've also seen it called "Cottage Pudding". I made the cobbler with peaches and blueberries... Wonderful! @Wafna: I understand the no-stir part -- the pudding is a bit of a mystery. Thanks for sharing. @Missy: Sounds like a fabulous combination. looks so good, makes me wish i liked peaches! @Margaret: Next time I see you, I'll make it without any fruit! It will just be cake (or pudding). Pudding doesn't have a cake texture so that's why it is reffered to as pudding.